Lilium lancifolium florae-plena (Lilium tigrinum). 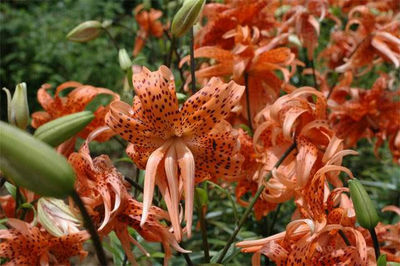 Also known as the ‘Tiger Lily’ this species originated from Eastern China and Japan. The deep orange double flowers with intense spots makes it a striking plant. Very good for cutflowers. Grows upto 120 cm tall. Cold tolerant.